This point layer represents estuaries present within PMEP’s spatial data system. This layer was developed by members of PMEP, based partly on previous estuary inventory efforts as well asthe goals of PMEP. 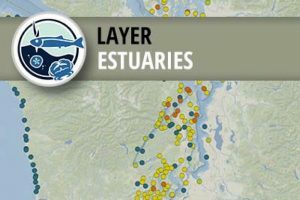 Currently, there are 444 estuaries present in this layer, covering the West Coast of the contiguous United States. Estuaries were included based on their current or future potential to provide habitat for fish species. It is possible that this list will expand or contract over time, as determined by the needs of PMEP.